Strong capitalization, promising reforms and low penetration rates are poised to lead to Mexican banking sector growth. As Mexicos star rises, so does the star of its banking sector. Banks are ready, willing and able to play a larger role in the economys overall growth, according to Alfredo Calvo, primary credit analyst with Standard & Poors in Mexico City. S&P expects bank lending to grow by 13 percent this year, up from 11.5 percent in 2013. The Mexican economy, which slowed to a sluggish 1.2 percent growth pace last year, is likely to expand by 3 percent in 2014, S&P forecasts. With the economy rebounding, Calvo sees growing demand from consumers for credit cards, payroll loans and mortgages, while small- and medium-size enterprises are likely to seek credit to expand their businesses. Expanded lending in these sectors will require more capital, as well as challenge banks to maintain asset quality and keep a lid on operating expenses. Even so, banks are in a good position to attend to all this great demand, Calvo says. Mexican banks have two key strengths: high capitalization and good profits. 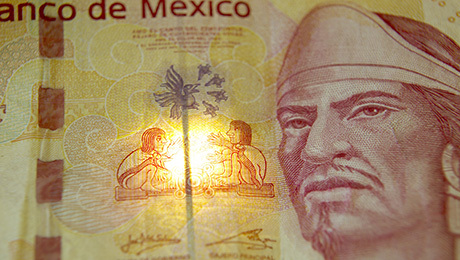 The Mexican banking industrys average regulatory capital stood at a comfortable 16.22 percent as of June 2013 (the latest available data), according to S&P, double the 8 percent minimum total capital required under Basel III and exceeding the minimum total capital plus conservation buffer, which is set to rise to 10.5 percent in 2019. The outlook for continued, sustained profitability is good. S&P predicts the return on assets at Mexican banks will remain stable at 1.25 percent over the next 12 to 18 months, in spite of increased lending, and continue to outperform banking sectors in Brazil and Chile. There is also plenty of room to grow because banking penetration, defined as private credit as a percentage of GDP, is one of the lowest in Latin America at 26 percent at the end of 2012, says Calvo. By contrast, penetration stood at 78 percent in Chile, 53 percent in Brazil and 37 percent in Colombia, according to S&P. Net interest margins are actually rising as banks expand their lending, according to S&P. Consumer lending as a share of all loans in Mexican banks rose from 37 percent in mid-2011 to 39 percent in mid-2013. Even though the Bank of Mexico, the central bank, lowered its reference interest rate from 3.75 percent to 3.5 percent on October 25 and maintained that rate at its December 6 and January 31 meetings, S&P is not expecting the lower rate to trim net interest margins, as banks will not be pressured to lower rates by a similar amount. Banks fund themselves largely through deposits, and S&P does not expect them to have to pay higher rates for deposits. Also, expansion in bank lending is occurring in retail loans, mortgages and the small-business segment, all of which have higher lending rates. Indeed, the ratings agency predicts that net interest margins will average 7.3 percentage points over the next 12 to 18 months, up from 6.8 percentage points during 2010 and 2011. In recent years credit loss provisions have averaged about 20 percent of operating revenues because of nonperforming loans. This figure is expected to rise to 25 percent for the second half of 2013 and for all of 2014, because banks are lending more to consumers and because of losses in commercial lending to troubled large homebuilders. At the end of the first half of 2013, consumer loans accounted for 69 percent of credit loss provisions, followed by 22 percent for commercial loans, 6 percent for mortgages and 2 percent for government loans. The Mexican banking sectors nonperforming assets peaked at 3.3 percent at the end of 2009, when gross credit losses reached a high of 6 percent. Although nonperforming assets were 3.5 percent at the end of June 2013, loan loss reserves were 1.5 times the size as those of nonperforming loans. Gross credit losses in the 12 months ending June 2013 were 2.6 percent, well below 2009 levels. S&P believes Mexican banks will struggle to maintain adequate asset quality metrics due to the prevailing global and local market conditions, subdued gross domestic product growth of 1 percent to 1.5 percent in 2013,the rapid pace of growth in consumer and small and medium enterprise loans and, to a lesser extent, to troubled large homebuilders. S&P is predicting gross credit losses will rise above 3 percent during the next 12 to 18 months. An improving outlook for Mexico led S&P to raise the countrys ratings not only on Mexicos sovereign debt but also for its banks. On December 19 S&P raised its rating on Mexicos long-term debt by one notch, to BBB+, with a stable outlook. The next day the agency raised its ratings one notch on 11 major banks. The list of upgrades includes six major banks sporting credit ratings of BBB+, with a stable outlook: BBVA Bancomer, Banamex (Banco Nacional de México), HSBC México, Grupo Financiero Scotiabank Inverlat, Banco Inbursa and Banco Santander. One of the reasons Mexican banks are in good shape is that they did not engage in overconfident lending in the years leading up to the 200809 financial crisis, according to David Olivares-Villagomez, vice president for Latin American banking at Moodys in Mexico City. The banks are also benefiting from recent financial sector reforms, such as the creation of specialized courts that can accelerate the repossession of assets when a borrower defaults on a loan. The government is establishing a universal credit bureau to collect information in a centralized location from privately owned credit bureaus in Mexico. This will improve the level of information available for banks for their credit analysis, says Olivares-Villagomez. The reform agenda championed by President Enrique Peña Nieto has made significant strides. The approval in December of a constitutional amendment to reverse a 75-year prohibition against private investment in the energy sector is the most significant reform enacted so far. Tapping into Mexicos vast oil potential should energize investment and growth throughout the economy, stated Lisa Schineller, S&Ps New Yorkbased managing director of sovereign ratings, on the same day the firm raised its sovereign debt rating on Mexico. Mexico has also merited a commendation from financial titan Laurence Fink, co-founder, chairman and CEO of BlackRock, the worlds largest asset manager. When you look at the world right now ... and you want to see which governments are actually doing something on the structural side that is good for their own economy that goes against their own popularity ... Mexico is right there, Fink said in November at a New York Times DealBook Conference. If I were 22 years old and I didnt know what I wanted to do, I would move to Mexico right now because I think the opportunity is huge there, he added. The move to open the energy sector to private investment is not expected to deliver an immediate boost to the economy. All of the reforms are expected to propel growth in the coming years, but we believe that for 2014 the effect is not going to be so clear, says Calvo. Instead, Mexico will benefit from a growing consumer sector at home and economic growth in the U.S.
Gerardo Rodriguez, a former Mexican undersecretary of Finance and Public Credit who is now a senior member of BlackRocks emerging-markets team, rates the countrys financial sector second only to its energy sector as an attractive destination for investors. Mexico has one of the most sophisticated financial markets of the emerging world, especially local fixed-income markets  not so much on the equity side, he says. There are different ways in which you can express a view on the country. And that certainly adds flexibility to the economy. Rodriguez particularly likes Banorte (Banco Mercantil del Norte), the nations third-largest bank by assets, with $120 billion as of September 30, and BanRegio (Banco Regional de Monterey). The economic climate presents an opportune time for smaller banks to expand, he says. The ability of the banking system to expand its lending will create investment opportunities, according to Rodriguez. Being a medium-income country, clearly as the middle class has been developing, people demand basic services  say, health care, education, certainly housing. There are a lot of good scenarios there that can become potential investment areas, he says. Follow Robert Stowe England on Twitter at @RobertEngland67.